It’s that time of year again when CTARC prepares for the International Lightship and Lighthouse weekend. This year it seems a bit later in the month but actually it’s not. It is always the third FULL weekend in August. For us down in the Southern Hemisphere it’s a time of cold weather and storms which makes it even more challenging. ​Once again we have arranged to man the Green Point lighthouse from the Saturday morning of 19 August until mid-day Sunday of 20 August. We have repeated this so often now that our Lighthouse team manages to do the set-up and take-down with military precision but we still need manpower from our members, especially around 10:00 on Saturday morning in order to get our beam antenna raised. 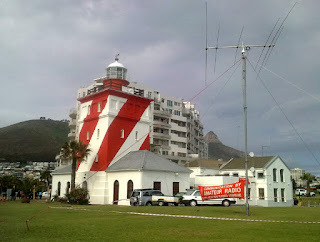 Even if you are not taking part in the Lighthouse weekend, it would be appreciated if club members could come and assist with the set up at Green Point on Saturday morning 19 August 10h00 and for take down on Sunday, 20th August at 11h00. (Committee members will meet at the clubhouse at 08h30 on Saturday morning to load antennas and equipment). We will be having our very popular and always well attended Sunset Bring n Braai on the Saturday evening so even if you are not planning to operate, please join us and bring the XYL along for this social event. Bring your meat, rolls and salads etc; along. We need operators for the event so please pop in and grab a mike or key and make a few contacts with us, it’s always great fun. If you are planning on staying over (the more the merrier,) then please do let me know soonest and I can arrange enough room for us all. We already have 5 staying over this year, which is great news.